Similarly, the subtleties between your digital video transmission options make each the perfect solution depending on the specific outcome you require most. When it comes to selecting between cellular, satellite or fixed line, one is not inherently better than the others; they each have their place. Is it bandwidth that matters? Flexibility, portability or mobility? Latency? Reliability? Video quality? Cost? Or perhaps a combination of them gives you the best chance to go live. Lets take a look at the differences between each option to help pick the right choice. Satellite has been the de facto standard because it gives you established stability and quality with a capability of transmitting speeds approaching 100Mbps of live video and audio. But now there are many satellite choices, such as Ku-band, Ka-band and BGAN. The fact that you are transmitting a signal to geo-stationary satellites 36,000km above the earth is precisely what gives satellite transmission its advantage. They dont rely on towers or networks to operate, they are, to all intents and purposes, always there, and you know you will get what you pay for. Satellite is the hands-down choice in situations that are remote or where a volatile situation may need standalone solutions that arent reliant on ground power. Large broadcasters have traditionally used satellite (Ku- and increasingly Ka-band) with their own fleet of trucks. The cost of the equipment and crews, the logistics involved in transporting it to where its needed, and the expense of booking satellite time have resulted in some broadcasters deciding to sell off their trucks. They have far from abandoned satellite though when the broadcast situation requires a high level of quality and reliability, they will still rely on satellite capability, often bringing in experienced and nimble third parties to provide connectivity and capability. Increasingly, broadcasters and service providers are equipping their trucks with both satellite and cellular capability to balance the reliability of satellite with the advantages of cellular delivery. Which brings us to just what makes cellular unique and when to choose it. The cost of satellite means that broadcasters have to pick and choose when to broadcast live. With cellular bonding, you can broadcast live from just about anywhere, anytime and for a fraction of the cost. The equipment involved is easily transportable and quick to setup. Its also comparatively less expensive to operate than satellite, and although still not viewed as a 24/7 solution, it is a great live streaming technology. Bonded cellular solution innovator and provider, LiveU, really burst onto the scene when NBC in the US used its LiveU units to broadcast newly elected President Obama as he travelled on his historic inaugral train ride from Philidephia to DC in 2009, a broadcast not possible with satellite. 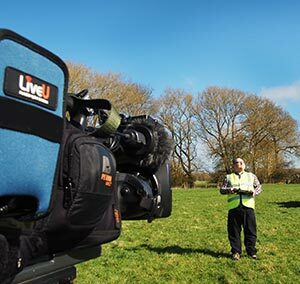 Carrying on the election theme, LiveU was used in the UK by Sky News for the last two UK elections. Using LiveU units, Sky made it into Guinness Book of Records by covering election night with 150 simultaneous live streams. Student broadcasters operated the LiveU unit at each polling station. The user-friendly interface on these units allowed them to easily operate the equipment after receiving just a quick briefing. The mobility, flexibility and cost-effectiveness of cellular have helped it to transform live coverage, and have made it possible for a slew of new players to enter the field. In addition to all the major broadcasters here in the UK, including Sky, ITV and BBC, many other groups transmit using cellular solutions, including: multiple Premiership and lower league football clubs; horse, greyhound and motor racing organsations;, online sports organisations; event producers; universities; corporations; and even community groups. It was even used to get footage from boats during Cowes Week and the Round the Island Race on the Isle of Wight this summer. As both cellular technology advances with 5G connectivity under trials and codec efficiency improvements with the introduction of HEVC its already envisaged that high-quality 4K transmission over cellular connectivity will not be far from reality. Fibre technology is developing at a pace. With operator backbones capable of seamlessly transporting Terabytes of data and installation becoming more prevalent and timely, fibre has become a key option for video transmission, offering up to tens of Gbps of speed, diverse paths for resilience and excellent latency. Many sports stadiums and venues employ permanent fibre connectivity. Other organisations connect venues on an event-by-event basis, especially on the international circuit. Sky Sports makes good use of fixed links together with NTT 4K UHD HEVC encoders to deliver world-class quality live footage back to decoders from grounds, including for Premier League matches and Formula 1 coverage for onward broadcast to high-value subscription paying viewers. Increasingly, remote production can be done over fibre links, resulting in big savings on production teams, and enabling live coverage of events where such coverage wasnt possible previously due to the costs of on-site facilities. Fibre is a dedicated capacity; its always there, but you are fixed at the location. The cost of installing fixed links can be high and it takes planning, so doesnt offer the flexibility of location needed to cover breaking news stories or mobile events such as cycling or marathon running. However, fibre continues to develop. Global connectivity companies now offer super-high-capacity connectivity networks, where the local challenge is to inject into their many PoPs worldwide to carry TV and event traffic across the world. This is then dropped out locally to broadcasters subscribing to live content for their regional viewers. Discussions are taking place already to use cellular or Ka-band technology to provide that local injection a definite harmonisation of connectivity technologies for global benefit. Each of these digital video transmission options is available and plays a unique, yet vital role. Sometimes you might find the best choice involves selecting a hybrid capability that merges options into one perfect solution to meet all of your needs. For example, covering a major sporting event, such as the Olympics, may use fixed fibre links from the stadium, satellite transmission to cover downhill skiing, and cellular links to follow the crowds favourite marathon runner around the course to get those unique viewpoints. Each contributes towards a great viewing experience. Increasingly, employing just one connectivity option isnt sufficient for the content being delivered. This is especially the case in premium sports. Fibre can be the primary feed, backed up by either satellite or cellular. In extreme cases, where every second can mean revenue to a broadcaster or betting company, all three technologies are deployed for a true belt-and-braces insurance policy against failure. Its clear that satellite, cellular and fixed fibre links will co-exist for a long time to come. The choice of connectivity technology will depend on the type of event, your audiences demands, your budget, and the level of risk around reliability and quality you determine to be acceptable. Your choice is also linked to the value of the content youre providing. Always remember: in the world of live broadcast , no one wants to finish second, or worse still, not finish at all.